Tecno AX8 seems to be the latest smartphone Tecno might be working on. The device has been leaked on Geekbench which also reveals some specifications of the upcoming device. According to Tecno AX8 Geekbench listing, it revealed that the phone will be coming with a whooping 6GB of RAM which is powered by Mediatek MT6757CD (Helio P25) octa-core processor clocked at 2.6GHz. It has always been the case whereby, not all devices that appeared on Geekbench listing turns out to be reality. Take for example, the Infinix X603 that once spotted on Gfxbench listing didn't made it out to reality. Up till now, we haven't heard anything about it. So, let's just hope Tecno AX8 won't just remain in ghost mode as Infinix X603 did. But i think this is going to be another family member of Tecno Phantom's series. 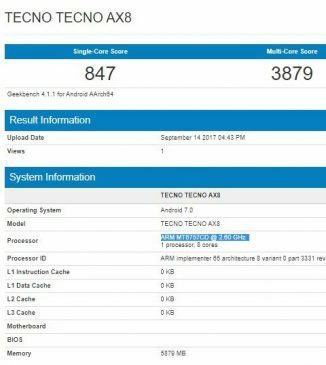 Though Tecno AX8 is yet to pass through FCC certification, so the full specifications cannot be ascertain at the moment but according to Geekbench listing, it will run Android 7 Nougat out of the box, 6GB RAM which is powered by Mediatek Helio P25 Processor. Should we really expect Tecno AX8 device or it's just a nightmare? TECNO happens to be one of the good phones` manufacturers. So I am not doubting them. Good things about TECNO, They too are coming up now. Their products are always nice.